Well this week's Tuesdays with Dorie selection was chosen by Caitlin. It was definitely out of the box for me, which is part of why I love this event! I'll admit I was a little wary, though, so I used my new little tart pans and halved the recipe- it yielded four tartlets. I used a dried fruit mix from Trader Joe's that included raisins and berries and they were delicious. I also skipped the butter on top of the batter and instead brushed the finished product with butter and sprinkled the cakes with sugar so they were cute and shiny. Personally, I thought they tasted like really sweet buttery cornbread (not quite what I was hoping for!). My husband thought they tasted like really sweet buttery cornbread (and he loved it!) So I guess it worked out in the end! I also dropped off a few pieces to my Brazilian friend since I heard this was similar to something they eat there- I'm still waiting for her verdict! Make sure to check out how everyone else did! I've had some frozen shrimp falling out of the freezer everytime I go hunting for some chicken, so I thought I would try this recipe out again. I made a few modifications but it got a "make it again" review so I guess it's a keeper! I served it with fresh green beans and think broccoli could be delicious too. My husband doesn't like seafood so I might try it with chicken next time, I think it would work well (and would make me feel less guilty for adding cheese, which I think it needed!) I always love Giada's recipes and this was no exception! Bring a large pot of salted water to a boil over high heat. Add the pasta and cook until tender but still firm to the bite, stirring occasionally, about 8 to 10 minutes. Drain pasta, reserving 1/4 cup of the cooking liquid. Meanwhile, warm the olive oil over medium heat. Add the shallots and garlic and cook for 2 minutes (be careful not to burn!). Add the shrimp and cook until pink, about 5 minutes. Add a few red pepper flakes if you like it hot. Add the cooked linguine, lemon juice, lemon zest, salt, parsley, cheese, and pepper. Toss to combine. Serve immediately. Up until about four years ago I didn't like avocados. I don't know where I got this idea but since I'd spent many years not liking them, I was shocked that when I finally tried them, I realized I LOVE avocados! I guess I have the same problem when it comes to Carrot Cake. When Amanda from Slow like Honey chose it, I figured, well at least I wont be tempted to eat it! Wrong again. I decided I'd better half the recipe and make cupcakes so I could easily distribute them to friends without keeping them at my house. So with Baby's help, I shredded the carrots and got to work, and here as my first mistake. Instead of using the small grater, I did the big size, and I think they weighed down the batter too much. The half batch of batter made 12 regular cupcakes, 6 minis, and a LOT of dishes. I put them into the oven and by the recommended time (I'd heard 25 minutes) all I had was flat mush. That's right. I baked them a little longer. They were still raw and funny looking. I ended up taking them out and just prying them out of the pan and dumping what I could salvage into a bowl that everyone snacked out of and topped their ice cream with. While my cupcakes collapsed and didn't quite work out, they tasted ridiculously delicious. So good I almost forgot I don't like carrot cake. I didn't make the frosting since I didn't have cupcakes but I use a similar recipe all the time and add lemon zest to it. I will try again another time with cakes, not cupcakes, and lemony- cream cheesey, delicious frosting. Make sure to check out the rest of the TWD peeps- hopefully they had better luck! So naturally, I got the recipe from Anna and when I saw the pound of butter I almost fainted. I mean, it tastes good, but that's really not helping my skinny jeans goal! Let's be honest, any cupcake isn't helping that goal. Either way, I attempt to thin it out a little bit and I still think it tastes ridiculously delicious. After I frost my cupcakes I use the extra to make graham cracker cookies (our technical term for a cracker slathered with frosting and topped with another cracker, then frozen. Yum). Trust me, this is one recipe where you'll be licking off the beater. And the spatula. And the bowl (and then you'll be too sick to eat a cupcake, which is a fair trade for me!). Melt the chocolate over a double boiler and set aside. 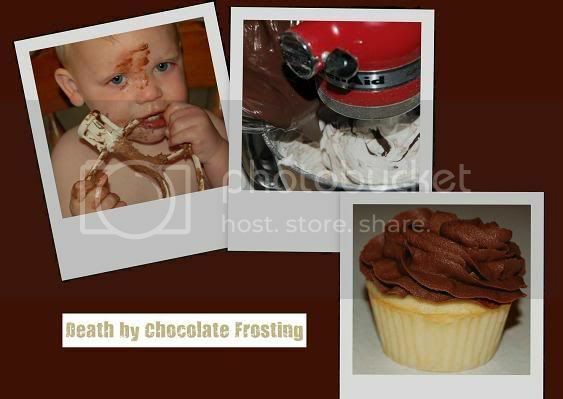 In a stand mixer with the paddle attachment, beat the butter and vanilla until fluffy. Add the powdered sugar and meringue powder slowly (I usually add it all, cover the mixer with a towel, and turn in on low) and then beat until fluffy and smooth. Add the sour cream, mix, then add the chocolate and mix just until blended. Frosts two dozen cupcakes. Whisk in the vanilla extract. Let sit for 5 minutes, then whisk in the bits of butter, stirring until they are full incorporated and the pastry cream is smooth and silky. (I skipped this step and just added it immediately after the vanilla) Scrape the cream into a bowl. You can press a piece of plastic wrap against the surface of the cream to create an airtight seal and refrigerate the pastry cream until cold. Spoon the pudding into a graham cracker crust and serve with whipped cream enjoy. This week for Tuesday's with Dorie, Judy chose Marshmallows. I have to admit, I don't really like marshmallows. But, my husband LOVES them, so I figured I would try it out. I ended up making them twice because the first time they did not turn out very well. Everything actually worked fine, and I liked doing the egg whites and the candy, but the cornstarch on top turned into a nasty thick skin by the time they were dried. So, I decided to turn my first batch into Rice Krispie Treats and started again (by the way- even with almost double the amount of cereal called for, these were soggy and turned into rice krispie goo, yuck!). This time it was really easy to make the marshmallows which I appreciated. I dusted another pan (this time I did a 9 x 9 square pan for more depth) and left the top bare. After they dried I plopped the pan out onto a silpat and tried cutting them with a knife, shears, and a pizza cutter. I think the pizza cutter made the smoothest lines but I was still displeased with the aesthetics of this dessert. I guess I'm a little crazy and like everything straight and perfect and floppy uneven marshmallows wasn't doing it for me! I dusted some in cornstarch with powdered sugar, some with cornstarch and cinnamon, and some with cocoa powder with finely chopped nuts (I swirled chocolate syrup through one corner of the pan after pouring it into the mold). They all tasted pretty good and my husband has been munching them all day, so I guess it was a success. I don't think I'll make them again anytime soon, but now I know you can make them at home (which I hadn't thought of before for whatever reason!) I might try the flavor variations too- mango or raspberry sounded awesome. Put 1/3 cup of the water, 1 1/4 cups of the sugar and the corn syrup in a medium saucepan over medium heat. Bring the mixture to a boil, stirring until the sugar dissolves. Once the sugar is dissolved, continue to cook the syrup -- without stirring -- until it reaches 265 degrees F on the candy thermometer, about 10 minutes. While the syrup is cooking, work on the gelatin and egg whites. In a microwave-safe bowl, sprinkle the gelatin over the remaining cold water (a scant 7 tablespoons) and let it sit for about 5 minutes, until it is spongy, then heat the gelatin in a microwave oven for 20 to 30 seconds to liquefy it. Working in the clean, dry bowl of a stand mixer fitted with the whisk attachment or in another large bowl with a hand mixer, beat the egg whites on medium-high speed until firm but still glossy -- don't overbeat them and have them go dull. As soon as the syrup reaches 265 degrees F, remove the pan from the heat and, with the mixer on medium speed, add the syrup, pouring it between the spinning beater(s) and the sides of the bowl. Add the gelatin and continue to beat for another 3 minutes, so that the syrup and the gelatin are fully incorporated. Beat in the vanilla. Using a large rubber spatula, scrape the meringue mixture onto the baking sheet, laying it down close to a short end of the sheet. Then spread it into the corners and continue to spread it out, taking care to keep the height of the batter at 1 inch; you won't fill the pan. Lift the excess parchment paper up to meet the edge of the batter, then rest something against the paper so that it stays in place (I use custard cups). Once they are cool and set, cut the marshmallows with a pair of scissors or a long thin knife. Whatever you use, you'll have to rinse and dry it frequently. Have a big bowl with the remaining potato starch or cornstarch at hand and cut the marshmallows as you'd like -- into squares, rectangles or even strips (as they're cut in France). As each piece is cut, drop it into the bowl. When you've got 4 or 5 marshmallows in the bowl, reach in with your fingers and turn the marshmallows to coat them with starch, then, one by one, toss the marshmallows from one hand to the other to shake off the excess starch; transfer them to a serving bowl. Cut and coat the rest of the batch. SERVING: Put the marshmallows out and let everyone nibble as they wish. Sometimes I fill a tall glass vase with the marshmallows and put it in the center of the table -- it never fails to make friends smile. You can also top hot chocolate or cold sundaes with the marshmallows. STORING: Keep the marshmallows in a cool, dry place; don't cover them closely. Stored in this way, they will keep for about 1 week -- they might develop a little crust on the outside or they might get a little firmer on the inside, but they'll still be very good. After I finished watching Julia Child's chefography yesterday, I watched the beginning of Wolfgang Puck's. Seeing all the gourmet pizza inspired dinner so did a Google search for his pizza dough recipe, and what do you know, he conveniently had it on his website. I made it in my Kitchenaid with the dough hook and not only was it fast, it was delicious! It's definitely the best pizza dough I've made yet (thanks for perfecting the recipe, Wolf!) 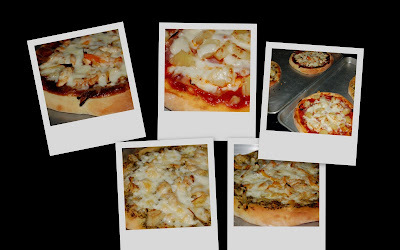 We made four individual pizzas and used whatever we had in the fridge for different flavors- BBQ Chicken, a few Pesto pizzas, and a Hawaiian. I think next time I'll try brushing one with butter and garlic and leaving it bare for an appetizer like they do at The Smokehouse. Yum. 1. In a small bowl, dissolve the yeast and honey in 1/4 cup of the warm water. 5. Divide the dough into 4 balls, about 6 ounces each. Work each ball by pulling down the sides and tucking under the bottom of the ball. Repeat 4 or 5 times. Then on a smooth, unfloured surface, roll the ball under the palm of your hand until the top of the dough is smooth and firm, about 1 minute. Cover the dough with a damp towel and let it rest for 15 to 20 minutes. At this point, the balls can be wrapped in plastic and refrigerated for up to 2 days. 7. Using a lightly floured baker’s peel or a rimless flat baking tray, slide the pizza onto the baking stone and bake until the pizza crust is nicely browned, 10 to 12 minutes. Remember that the oven is very hot and be careful as you place the pizza into and out of the oven. Transfer the pizza to a firm surface and cut into slices with a pizza cutter or very sharp knife. Serve immediately. 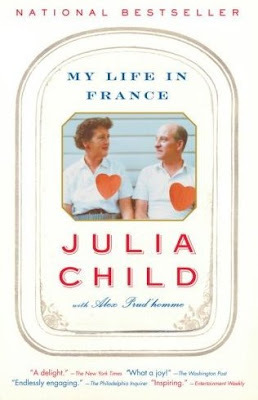 I just finished reading My Life in France by Julia Child and Alex Prud'Homme. This book was in my recommendation section on Amazon so I picked it up from the library and didn't put it down until I finished it. It's beautiful. I remember watching Julia Child once or twice on TV but I'm too young to really remember her (though I remember how tall was and I've since always related to her!). Reading this book makes me feel like I know her and makes me sad she is gone! I'm going to have to order her cook books now too! I studied abroad in Paris one summer and reading her descriptions of La Belle France made me ache to go back. What a wonderful book... I feel like I should run off and make her bread now! From the candid recounting of her adventures to the beautiful descriptions of the food, I enjoyed every bit of this book. One of the things that she said especially stands out to me. After describing a horrible kitchen disaster, she says that she didn't apologize to her company or berate herself. She says that cooks should never start in on self-deprecations but "must simply grit her teeth and bear it with a smile- and learn from her mistakes." (pg. 71). I'm going to take this to heart! After all, everyone has to learn sometime. And as think book points out, not even Julia Child was perfect- but she worked hard and never compromised. And that's what made her wonderful. I found a recipe for these sandwiches on Baking Bites a few weeks ago. The first time I made it my Dad said, "Hey, this tastes better than Vito's!" (the local expensive Italian place). That's about as big of compliment as he gives, so look out, these are tasty. I made a few modifications, so here is my version. Throw this in the slow cooker in the morning and you'll be all set for a tasty dinner. My husband prefers BBQ so he just throws some BBQ sauce on his meat and everyone is happy (even if I think he's ruining it!) This is a nice, quick, versatile meal. Cover beef with pepper and place in slow cooker. Chop onions and garlic and add to the beef. Add the liquid and the soup mix and cover. Cook on high for about 5 hours (maybe 8 hours for low... but I always seem to be in a hurry!) Meat should be extremely soft and shred when you touch it. Pull it apart and let it sit in the juice for a few minutes before serving. Serve on halved rolls with reserved liquid for dipping. Enjoy! *edit*- last time I made this I just omitted the juice and the soup mix, added a little kosher salt, and enjoy. Simple and delicious! 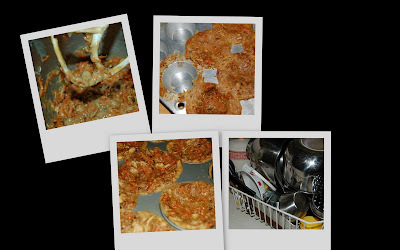 This weeks recipe for Tuesdays with Dorie came from Mary of Starting from Scratch- she has some great photos on her blog and I'm going to try some her vegan recipes, though I'll probably need to make some hot dogs on the side for the guys, lol. The Most Extraordinary French Lemon Cream Tart. Doesn't that just sound delicious? I had a few bumps along the road but it was tasty anyways. All the men were busy on Saturday night so the ladies headed over to my Aunt's to bake together. The recipe is over at Starting from Scratch. Check it out and the other great TWD entries! I used the new Ronzoni smart taste which is higher in fiber and tastes great (same with the Barilla too). I have also added pureed vegetables to my pasta dishes in the past without adverse taste or texture. Sometimes I sneak a container or two of baby food squash in and no one is the wiser. I'll get around to making puree's like Deceptively Delicious and The Sneaky Chef recommend, but for now, baby food works and I have it on hand anyways! Cook pasta one minute less than the al dente directions. The macaroni will continue cooking so make sure to cook it at least a minute or two less so it doesn't turn mushy. Brown the sausage in a skillet or grill pan until heated through. Then cut into 1/4 inch pieces and set aside. Grate 1/2 an onion into a large saucepan with deep walls. Add flour and butter and put over low heat. Make a roux by whisking it together and cooking it on low for a couple of minutes to cook out the flour taste. It should be nice and light brown. Then, whisk in the milk and chicken broth until everything is well incorporated. Add fresh ground pepper, and red pepper flakes if you like it hot, and let it thicken up for a few minutes, stirring occasionally. Stock or bullion is usually so salty I don't add any salt at all. After sauce is nice and thick, remove from heat. Slowly stir in the cheese, but be careful to not overeat it so it begins to separate. Put the cooked pasta into a 9 x 13 baking dish. Add the sausage, green onion, and halved grape tomatoes (if you like cooked tomatoes, I only did this in half of my dish). Pour the cheese sauce over everything and stir. Top with breadcrumbs, if desired, cover with tin foil, and bake for 15-20 minutes at 350. Make sure the pasta is underdone, though, or you'll end up with macaroni mush! I usually just bake mine for a bit to warm everything through, turn off the oven, and leave it in there until everyone is home and ready for dinner. Enjoy! *Make homemade lemonade or limeade, my favorite- 1 C. juice, 3/4 C. of sugar (more if you are like my husband! ), and a pitcher full of water. Yum! *Make a cake and add zest to the frosting. Substitute the liquid in the recipe for lemon or orange juice. I like this especially with red velvet cake and to garnish the cake with some strips of zest too. *Try Jenny's lemon poppyseed muffins over at Picky Palate. These are so delicious, I honestly make them once a week. This is the first recipe I ever made off a foodie blog and my favorite yet. Seriously, go make them right now. *Make french toast and top it with a little butter, powdered sugar, and a squeeze of lemon or lime. *Take your favorite cinnamon roll recipe and instead of brown sugar and cinnamon, spread the dough with butter, granulated sugar, and orange jest. After baking, top with a glaze of powdered sugar and orange juice.